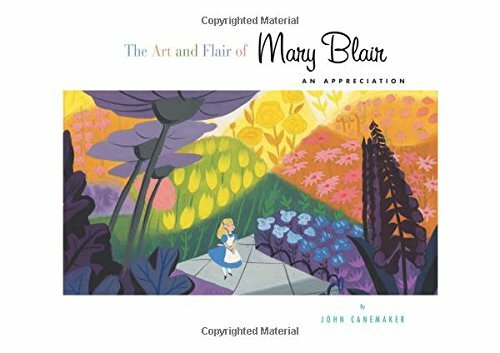 The Art and Flair of Mary Blair: An Appreciation was first published in 2003 and this is the updated edition. The only thing that's updated is actually the cover art. In essence, it's a reprint, a second edition. This 128-page hardcover is published by Disney Editions and authored by the John Canemaker who has also written many other animation books. Mary Blair was an American artist who used to work for Disney before she pursued her freelance career. She's an influential artist noted for her creativity and joyful colour palette. This book looks at her life and career and is sort of like a biography. The book follows her life in chronological order starting from her training and even showed her watercolour works. Next would be the artworks she created for Disney and finally the work she produced while freelancing. Among the works, you'll probably find familiar works such as those from Cinderella, Peter Pan, Alice in Wonderland. She's also known for the "It's a Small World" exhibition at the 1964 New York World's Fair. Mary Blair's work has a child-like quality to them. Her design sensibilities to colour and design are wonderful and can be seen in the artworks showcased in the book. Many of her works could have been printed bigger. There are reviewers from the earlier edition complaining about the inaccuracy of colour reproduction and amount of content which is lacking, both the text and the number of artworks included. I've not seen Mary Blair's original works so I can't really comment on the colour reproduction. About the lacking content. At times I do feel like there's more to Mary Blair's life than what's included in the book as she's a very prolific artist. It's for certain that there are a lot of Mary Blair's artworks that are not included in the book, however they are included in another book. This reprint was released in the same month as another Mary Blair book titled Magic Color Flair: The World of Mary Blair, a companion to similarly titled exhibition held at the Walt Disney Family Museum. The difference between the two books? Magic Color Flair focuses more on the design, the aesthetics of Mary Blair's work. Interestingly enough, that book features many of the artworks that are not included in the book. I'm quite surprised by the lack of duplicated artworks between the two books which is certainly less than 10 pieces. So if you want all of Mary Blair's work, you have to get both books. The Art and Flair of Mary Blair is a fine book that I can recommend to Mary Blair fan and animation lovers. My main complaint would be that the writeup could be more in depth, and the second complain is you have to spend more money to get the other book just to see the artworks that are not included here.